Happy Halloween! Let’s have a (sort of, but not really) scary Spinning in Cowgirl Boots tale. There you have it. Your life in yarn. Maybe I could pick up the trick of controlling mortal fates with my handspun, like The Three Fates in Greek myth. Sure would be a handy way to bump off a few of the more annoying people we have around here! On a side note, you would think there would be TONS of artist renditions of that blood-drenched loom from Darraðarljóð, the skaldic poem in the Njal’s Saga. Nope. Not that I could find. I guess we are stuck using our imaginations. A wood craved engraving by Edward Burne-Jones, 1869. So we have to picture something like that with human heads dangling along the bottom, strung with intestines, using arrows and swords to make the tapestry. Now if I could do that… no one would mess with me. Ever. Or they would hunt me down and lock me up in a very small room for the rest of my life. 8 Comments on "Mythic Crafters with the Power of Life and Death"
I love it when you tell stories! Love it, love it, love it! Ican just see it now Jenn with heads strung up all around lol! Where do you find these wonderful tales to share with us? On a different note just saw cars washing away in Austin on the news. Hope you are out of danger. So you love the guts and the gore too! Nice to find a kindred soul. I’m fine. No washing away here. I stayed indoors and out of all that mess. But there were floods and many people had to be rescued from their cars. 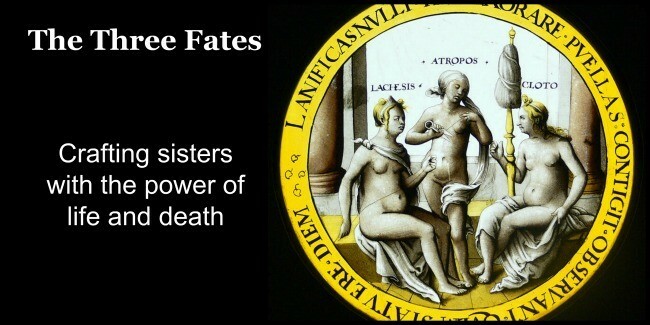 I was wondering when you would get to the Fates! Loved your video, so nice in a grey afternoon. Have been reading about and looking for these miths and stories and golden fleeces. So glad you enjoy them too ^_^ Happy Halloween!!! What a fantastic story time ! Thanks so much for that, and the historical information that I had not heard about before. I really enjoyed watching you spin as well. I do not spin myself, but I dreamed I could. Instead, I got out my yarn, and bought new hooks and needles, and have been knitting and crocheting since. That’s a little over a year now. Fiber arts do rule the world, no doubt about it. I enjoy your blog very much. Happy Halloween all ! I really enjoyed that! Your voice is so relaxing and the story was really interesting.